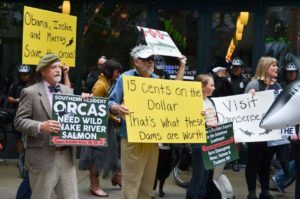 Dam breaching protesters call for the removal of the four Lower Snake River dams. Lower Granite Lock and Dam (near Pomeroy). We believe that in order to save endangered Snake River salmon and the Southern Resident Killer Whales, the four lower Snake River dams must be breached by the current Administration using the 2002 FR/EIS, not a long drawn out NEPA process. Want a great written overview of the policy and factual reasons for breaching? Want to learn why the US Army Corps of Engineers can breach the dams without another NEPA process? Want to learn more about the biology? Want to learn more about the economics? Want to learn more about why the Northwest does not need the power from these dams? Want to learn how barging products to market over reservoirs generates more greenhouse gasses than rail or truck? Want some inspiration to help save endangered salmon and orcas? The Bonneville Power Administration 2018: Threatened, Endangered, or on the Brink of Extinction? If you would like a slightly deeper dive, you will find these and additional one and two page summaries here.